The end of the Second World War saw a number of ‘satellite’ new towns develop to the north and east of London – in Hertfordshire1 and Essex in particular. With the troops returning home and their wives being cast out of the munitions factories it wasn’t long before the birth rate shot up. Furthermore, most of those lured to the new towns were newly-weds or families with young children. The Butler Education Act of 1944 had extended secondary education to all, and it soon became clear that a major school-building programme was necessary. In Hertfordshire alone it was realised that 174 new primary schools would have to be built over fifteen years. In 1945 a new architectural department was set up in that county and one of the young architects who joined the team was David Medd. His future wife, Mary Crowley, crossed over from the education department at the same time. Burleigh School at Cheshunt was one of the first schools built using a prefabricated modular system that Medd had helped to develop. Building started in late 1946 and finished in May 1948, largely to the design of Mary Crowley. 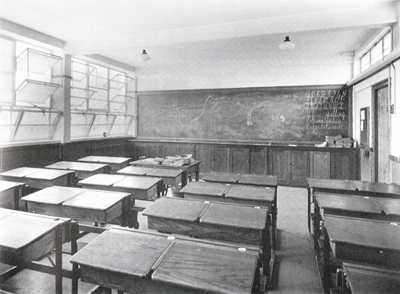 …the classic inter-war model of a classroom for all ages was the norm. Illustrated here is Priestmead School, Harrow, in Middlesex (below). Rows of locker-desks face a large blackboard, with light flooding in from the left, supplemented by clerestory lighting from the right. Classroom at Priestmead School, Harrow. Here is not the place to elaborate on the philosophy behind ‘progressive’ teaching. Indeed, that was to come later, if at all. However, the success of the school-building project in Hertfordshire was due to the close links between the architects and the educationalists. The latter tried to convey in a broad visual sense the environment which they felt that children needed and the architects responded. As this all took place within a small authority like that in Hertfordshire it was possible for fine tuning to be carried out – something that would not have happened had the architects been in private practice. It has already been shown in the post dealing with the design of factories and offices at this time, that good use of colour and lighting was crucial to improving health, stimulating morale and increasing output. 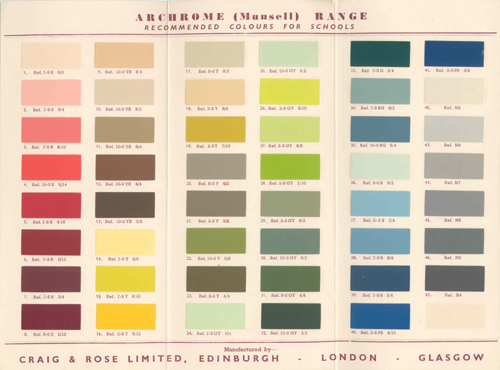 Where colour was concerned, the early work on the Hertfordshire schools was to show that, if properly understood and successfully applied, it could be made to do much more than merely cover and provide a finish to surfaces. Colour could make a direct and positive contribution to the design of a building. i am currently stranded in Vienna with a nasty flu, however while in bed I have been reading your blog and website with much interest and enjoyment. What a pleasure it is to read such an accessible and well written analysis on so many paint related subjects. Your site is an invaluable source of information and also very thought provoking. How kind of you to say that Richard. Sorry to hear about the flu. At least there’s lots on the site so you shouldn’t run out of things to do. Sadly, at the moment, there is a glitch with the site and neither the embedded documents nor the maps are working. It seems that they’re not compatible with the new release of WordPress. We’re struggling away with this so it might pay to revisit in a week or two. Could you let me know where to find the original so I can credit it in my footnotes. Thanks in advance, your post has been fascinating and enlightening. Yes, of course. It’s from: Andrew Saint. Towards a Social Architecture. 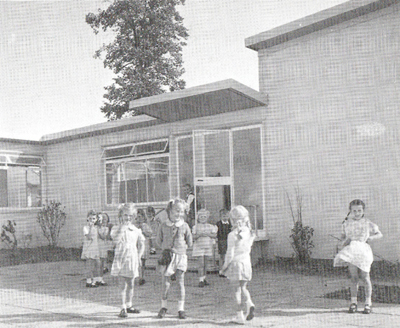 The Role of School-Building in Post-War England. Yale. 1987. pp.90-91.